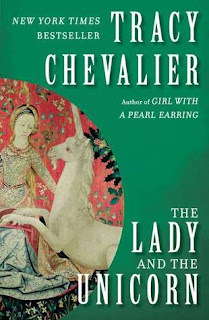 I wanted to read The Lady and the Unicorn thanks to the exhibition currently on at the Art Gallery of NSW. As a long-time cross-stitcher, the tapestries fascinate me. I've been to see them twice so far, & hope to see them one more time before the exhibition ends later this month. This is only the third time that the tapestries have left France in 500 years. Designed around 1500 in Paris, they are an extraordinary example of medieval art. Very little is known about their exact provenance which has created much speculation. Chevalier has used 'sensible suppositions' to weave her fiction. Initially I was dismayed by what I felt was lacklustre writing. By the end of the first chapter, I wasn't sure I would be able to continue. I may have been too critical as I was coming off the back of the incredible Sugar Money by Jane Harris written in the patios of 1765 Martinique and Megan Hunter's poetic cli-fi story, The End We Start From where the poetry existed in every word as well as in the gaps between. After two such innovative, exciting narratives, perhaps any regular story would have been a bit dull. 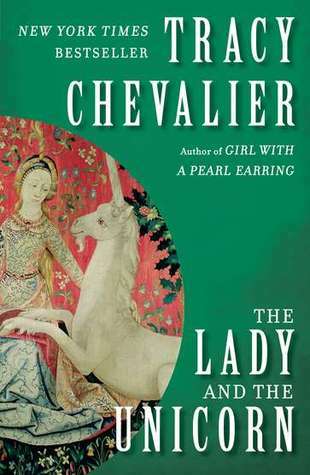 I'm glad I persisted as Chevalier's suppositions were enlightening and entertaining. She obviously researches her subjects thoroughly, then weaves this knowledge through her story with a deft touch. With a tapestry you stand close as you would to a friend. You see only part of it, and not necessarily the most important part. So no thing should stand out more than the rest, but fit together into a pattern that your eye takes pleasure in no matter where it rests. Chevalier took the time to show us (via the faces of the women and the stories behind them) that not only can an artists intent and interpretation change with time but that different people view different things in the work, depending on their mood and experience. All theses ideas are valid as well as being the very thing that makes all art such a personal and rewarding experience. I learnt a lot about the life and times of medieval France, the art of weaving and the lot of women in a strict patriarchal society. Unlike many of the books I've read recently, Chevalier wrote a good old-fashioned ending complete with epilogue and a what-they-did-next wrap-up. Very satisfying. How wonderful that you get to see them in person. I would love to see these tapestries, and have actually been working on a teeny "microstitchery" project of the Hearing tapestry. It's maybe 7" square, worked on silk gauze. I'm not quite a third done. I think if I hadn't had the motivation of the real-life tapestries, then I would have given up early on too Jean. I haven't cross-stitched anything since my youngest nephew was born (5 yrs ago). I had a run of baby blankets during that period & felt a bit burnt out by the end of it. Just starting to feel like I might be ready to tackle something new again. Doing part of the lady & the unicorn would be amazing! I get a bit annoyed with the modern-sounding voices in this writer's work, which is a shame as she really does obviously do her research! That was one of the things that bugged me too Liz. I had hoped to like her stuff enough to read her one about Mary Anning (Remarkable Creatures), but I think I'll pass on it now. ....weren't there a bunch of comments here before? I put one in, right? Perhaps they were on the cusp of the time frame when my comment moderation kicks in. Or perhaps it was just blogger playing silly buggers again!